The caladaran are reknowned throughout Avendar for their wisdom. 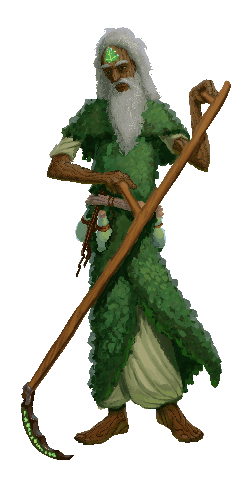 Tall, gentle creatures with odd bark-like skin, they tend to live either in forests or among the mountains, where they are known for their secluded lifestyles. Recently, however, many Caladaran have been known to descend into the towns, mixing with civilization and crowds. Few in number, the Caladaran are long-lived and reknowned for their skills as sages, refusing direct physical confrontation. Due to this tendency to avoid physical violence and to seek a more spiritual mode of existence, caladaran tend to regain health less rapidly than other races. However, this passive mode of existence allows more time for meditation, allowing mental energy to be regained more rapidly. Caladaran may be good or neutral, and may not be chaotic in nature. They may become bards, druids, psionicists, and scholars. You can view several sample descriptions from past caladaran characters.